← R.I.P. Murray Hawkins, Jr.
Chavez’s death leaves big questions about the country’s massive oil reserves. Production efforts are currently down in Venezuela, and have declined by more than 20% since 1998. Although state-run oil company Petróleos de Venezuela (PDVSA) is expected to increase that production, it’s likely to have little effect on icy relations between the South American country and the United States. Chavez’s use of Venezuelan oil resources is also controversial. Oil initially thrived within the Venezuelan economy under Chavez’s rule. The country is believed to have the largest oil reserves in the world, and Chavez grew PDVSA during his time in office. High oil prices brought billions into the country; meanwhile Chavez began kicking U.S. E&P companies out. Oil gave Chavez the ability to buy the loyalty of Venezuela’s poor (gasoline is a government-subsidized $0.18/gallon there, the cheapest consumer price in the world) and the friendship of the Castros in Cuba. Without oil, Chavez would have been just another Latin American thug, like Manuel Noriega but with a better complexion. As for the Hollywood Left, they never met a Socialist strongman they didn’t like. [Gina] McCarthy led Connecticut’s Department of Environmental Protection from 2004 to 2009. She also held senior roles in Mitt Romney’s administration when he was Massachusetts governor a decade ago, but her selection for the top EPA job is likely to bring criticism from GOP lawmakers. The Energy nominee has argued that natural gas can play a role in helping curb greenhouse gas emissions, but that stance has angered activists who believe fracking harms the nation’s water supplies. The U.S. branch of Greenpeace criticized Moniz when reports last month suggested he could be a possible replacement for Chu. But many of the largest and most politically connected environmental groups, including the National Wildlife Federation, Natural Resources Defense Council and the Environmental Defense Fund, have not expressed concerns over his selection. Any nominee opposed by Greenpeace can’t be all bad. In any case, the press has never really caught on that it’s the policies of the Department of the Interior and the EPA that really drive U.S. energy policy, not the Department of Energy. Exxon Mobil Corp. will increase its annual spending on energy projects by $1 billion, Chairman and CEO Rex Tillerson said in the company’s annual analyst meeting in New York. The increase will bring capital spending levels to about $190 billion over the next five years, or $38 billion per year, a new record for the oil giant. “I never would have dreamed I’d be spending at this level,” Mr. Tillerson said. Mr. Tillerson said the company’s production of oil and other liquids is expected to increase by an average of 4% per year from 2013 through 2017 as Exxon starts production at 28 major oil and gas projects, 24 of which are heavy in liquids. New production startups in the next five years will total about one million oil-equivalent barrels, Mr. Tillerson said. Mr. Tillerson’s emphasis on oil production over natural gas reflects the low natural-gas prices that have hit North America in the past few years. The company has been criticized by investors for its 2010 purchase of XTO Energy Inc., which made it the largest natural gas producer in the U.S. just before prices plummeted due to overproduction. If oil companies make lots of money, they have lots of money to invest, which in turn brings future costs down. The money they don’t invest in drilling gets returned to their shareholders as dividends. And who owns the big oil companies? You and me, mostly. The fact is, we Americans are voracious energy consumers, but most of us resent the very companies that satisfy our demands. The study, which brought together the related research in engineering, geoscience and economics, examined on a well-by-well basis production data from over 16,000 individual wells in the Barnett play through mid-2011. The study results indicate significant recoverable resources remain in the Barnett play, with total recovery at greater than three times cumulative production to date. The study’s base case forecasts the Barnett, at a base price of $4 per thousand cubic feet of gas, will produce approximately 44 trillion cubic feet (Tcf) of gas through 2050 based on already drilled wells and well that will be drilled through 2030. In the base case, production will plateau from a current high of 2 Tcf per year and slowly decline to about 900 billion cubic feet per year by 2030. Cool graph. The colors show how each year’s drilling has added to the field total production. This is just the first of several shale studies conducted by the Bureau of Economic Geology at the University of Texas. This one highlights the “sweet spots” in the Barnett and provides an economic model to predict future development under various price scenarios. 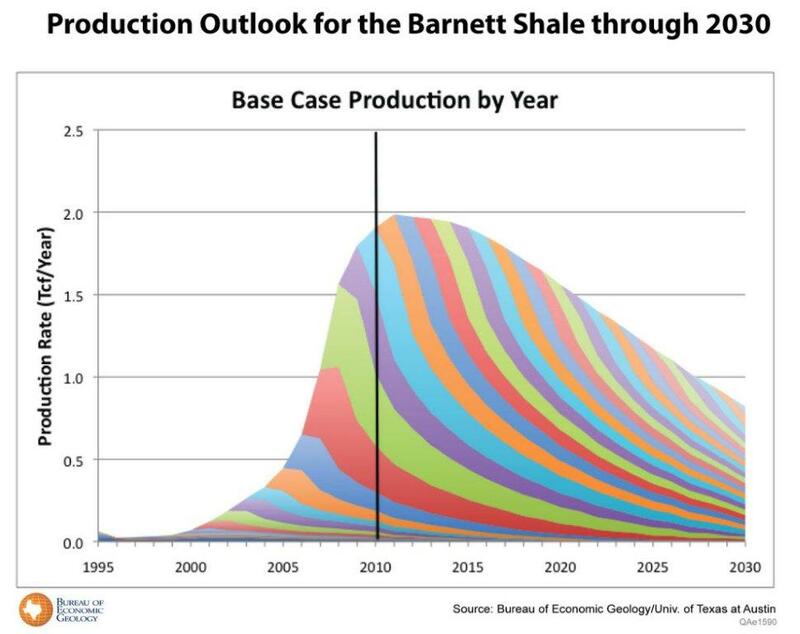 The Barnett is the most mature of the major shale gas plays and is only now peaking in deliverability at roughly 2 TCF/year (compared to total U.S. production of about 24 TCF/yr). U.S. Sen. Mary Landrieu has asked the Environmental Protection Agency to lift its November suspension of oil company BP’s ability to secure new federal contracts, including oil leases in the Gulf. Landrieu, D-La., said the EPA doesn’t have the authority to regulate the oil and gas industry and that what she considers arbitrary action against BP could “have a chilling effect” on other companies’ desire to drill in the Gulf. Sen. Landrieu is a Blue Senator, up for reelection in 2014 in what has become a very Red State. Energy state democrats have become something of an endangered species. But there’s something about Mary: she’s no dummy. She knows upon which side her bread is buttered, and as a result, she is one of the energy industry’s most reliable voices on Capitol Hill.